Joker Vegas 4Up by iSoftBet is a classic poker game, but presented in an unusual way. Let’s start with graphical quality: there are none. All we have is a static image of playing cards and a casino, but that’s not the point – these games are known for their entertainment value and prizes, not for fancy graphics. And Joker Vegas 4Up delivers a satisfying experience on both points, so let’s move on to “content”. What does the game offers? The interface is pretty simple: to the left we have a paytable. A list of poker hands is can be seen on the table, each with a different cash prize. As you can guess, Royal Flush is the most valued hand with a prize of 400 coins. But as we will explain below, the maximum cash prize in the game is 1.200 coins. To the right of the screen, you can see four rows. Each one represents a poker hand and has a multiplier value next to it, between 1x and 8x. For example, if you get a straight flush at the top row (the one with the 8x sign), you won’t get the normal payout of 50 coins – instead, you get 400 coins. Basically, you multiply the payout with the multiplier value, that’s why the maximum payout in the game is 1.200 coins. The good news is, you can play on all of the rows with only one coin. In other words, you get four different “lucky draws” with one payment and all payouts are separate. You can win on all of the rows and get paid separately. If you decide to use the “gamble” feature, you can raise your payouts even more. (Gamble feature is a mini guessing game and can be activated after any winning draw.) There is only one catch: to continue playing in the top row, you must first draw a winning hand at the bottom one. The hand value doesn’t matter, as long as it is an official hand, you can move on to the top row. Each hand can cost between 0.10 – 0.25 – 0.50 and 1.00 coin. You set this value from the bottom left side of the screen. The maximum bet is 4.00 coins, since there are four rows. You get 1.000 complimentary coins in the demo mode, so you can literally play for free for hours. 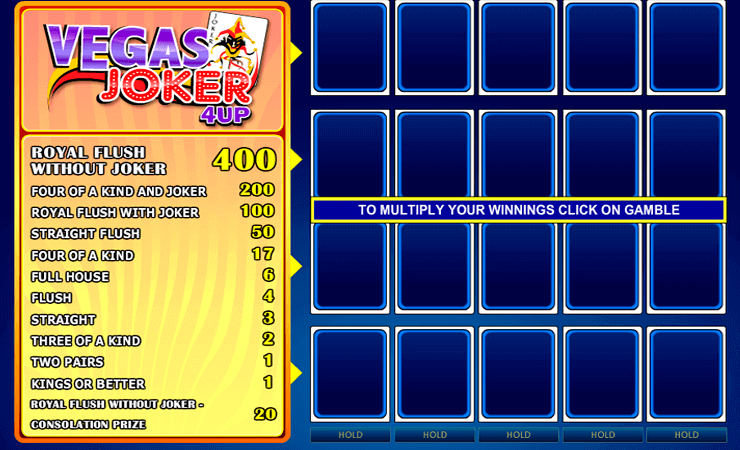 Joker Vegas 4Up is a fun and awarding game and we can recommend it easily if you like to play poker games.